Did you know that the airlines are required by law to block seats up to 24 hours prior to a flight for those of us with hearing loss? No, you can’t have champagne in First Class, but you can be in the front seats of coach (or your class of service), so you can be alerted to emergency announcements (beats 34E every time). Listen!Up presented this in 2016 but comments at chapter meetings call for a repeat. In May of 2016, the FAA, in order to comply with the Americans with Disabilities Act, issued a rule applying to all commercial airlines. The Rule, 14 CFR Part 382, is parsed and highlighted below by clicking “READ MORE”. Every U.S. airline displays a link on their webpage and assigns trained personnel to handle your seating arrangement if you identify as deaf or hard of hearing, they are required to provide a seat for you and your travelling companion and to assist you with the announcements as well. 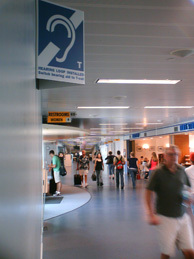 The seats are required to be blocked for disability assignment up to 24 hours before the flight. An airline that has open seating such as Southwest can designate your ticket for disability seating at any time prior to boarding announcement to give you priority along with other disabled flyers. You are boarded ahead of all other passengers. §382.81 For which passengers must carriers make seating accommodations? As a carrier, you must provide the following seating accommodations to the following passengers on request, if the passenger self-identifies to you as having a disability specified in this section and the type of seating accommodation in question exists on the particular aircraft. Once the passenger self-identifies to you, you must ensure that the information is recorded and properly transmitted to personnel responsible for providing the accommodation. §382.83 Through what mechanisms do carriers make seating accommodations? (1) You may “block” an adequate number of the seats used to provide the seating accommodations required by §382.81. (i) You must not assign these seats to passengers who do not meet the criteria of §382.81 until 24 hours before the scheduled departure of the flight. (iii) You must assign a seat meeting the requirements of this section to a passenger with a disability listed in §382.81 of this part who requests the accommodation at the time the passenger makes the request. You may require such a passenger to check in and request the seating accommodation at least one hour before the standard check-in time for the flight. If all designated priority seats that would accommodate the passenger have been assigned to other passengers, you must reassign the seats of the other passengers as needed to provide the requested accommodation. (c) If you do not provide advance seat assignments to passengers, you must allow passengers specified in §382.81 to board the aircraft before other passengers, including other “preboarded” passengers, so that the passengers needing seating accommodations can select seats that best meet their needs. HLAA’s involvement in forums, where people with hearing loss are considered, is critical to the work of HLAA representing not only members, but also all persons with hearing loss. Further, when HLAA speaks, our voice is heard and respected. The FTC brought together researchers, health care providers, industry representatives, consumer representatives, policymakers and others to examine ways in which enhanced competition and innovation might increase the availability and adoption of hearing aids by people who need them and aren’t currently using them. In addition, the workshop looked at how to balance consumer health and safety issues with consumer interest in greater competition and innovation. 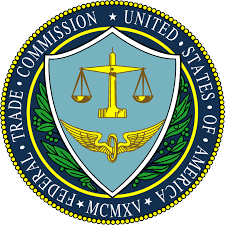 The FTC also wants to ensure that consumers have access to truthful and non-misleading information about hearing health products and services. HLAA Executive Director Barbara Kelley and Board of Trustees Member KR Liu were on the panel, “Informing Consumer Choice in Hearing Health Care.” Barbara talked about HLAA’s position on affordable and accessible health care, including support for recent legislation that would require the FDA to create a new category of over-the-counter wearable hearing devices. KR talked about her experience as a person with hearing loss that would like to see innovation and competition in the industry. HLAA had a strong presence at the workshop. In addition to Barbara and KR, Board Members Don Doherty, Richard Einhorn and Meg Wallhagen attended, as did HLAA Director of Public Policy Lise Hamlin and HLAA Professional Advisor on Technology Linda Kozma-Spytek. HLAA’s involvement in this workshop – and any other forum where people with hearing loss are considered – is critical to our work in representing us, the consumer. You can be sure HLAA will be there for you – people with hearing loss who need affordable and accessible hearing health care. On March 21, Senators of both parties reintroduced legislation (S.670) to make hearing aids for those with mild to moderate hearing loss available over the counter (OTC). A companion bill (HR 1652) was introduced in the House on a bi-partisan basis as well. The Over-the-Counter Hearing Aid Act of 2017 would make certain types of hearing aids available over the counter to Americans with mild to moderate hearing loss. In addition, the proposed legislation would require the FDA to write regulations ensuring that this new category of OTC hearing aids meets the same high standards for safety, consumer labeling, and manufacturing protections as all medical devices, providing consumers the option of an FDA-regulated device at lower cost. HLAA went on to say that “We know that people who can’t benefit from an OTC device and have more complicated fittings need insurance and Medicare coverage for hearing aids and rehab services. We have a window of opportunity now with a lot of attention focused on hearing health due to the NAS report, of which HLAA was a consumer sponsor. Make your voice heard. The momentum is building and HLAA is there. Federal agencies and policy makers are looking to HLAA to hear about consumers and what we need. We are there every step of the way”! 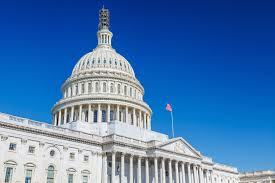 HLAA in Bethesda, our national office, has a small staff but a large voice in Washington. HLAA recently announced that Lise Hamlin, HLAA’s Director of Public Policy, was named as co-chair to the Disability Advisory Committee (DAC) for the FCC. The DAC was established in December 2014 to make recommendations to the FCC on a wide array of disability matters within the jurisdiction of the FCC and to facilitate the participation of people with disabilities in proceedings before the Commission. The DAC is organized under, and operated in accordance with, the provisions of the Federal Advisory Committee Act (FACA). The DAC’s first term expired on December 29, 2016. During its second term, the DAC will have subcommittees on emergency communications, relay/equipment distribution, technology transitions, and video programming. If you have concerns with captions, emergency notifications or other issues under the FCC jurisdiction, do not hesitate to contact our advocate at lhamlin@hearingloss.org. Advocating for TV captioning has never been easier. It now only takes two minutes online to complete the form; the FCC automatically responds within an hour assigning a complaint number and then advises of the investigation process within 24 hours. Nearly all TV broadcasting MUST be captioned with few exceptions. The most common exceptions are 2:00 AM to 6:00 AM programming, local educational programming and public service announcements. Thus, 100% of network programming from 7:00 AM to 2:00 AM must be captioned, and the FCC no longer accepts garbled and out of synch captions. The FCC prefers complaints be filed with the local cable or TV station; however, they accept complaints direct and then require a response from the local provider. Recently, a member saw garbled captions on a cable news network morning show. They e-mailed the complaint form, received an FCC complaint number an hour later, was contacted by the FCC by phone the next day, and advised the following day of a technical computer failure by the network that was now resolved. All within 48 hours – unheard of with the “Feds”. Thus, it is simplest to file an online complaint by filling in a few blanks and, when possible, attach a phone/tablet picture of the lack of captions or garbled captions. 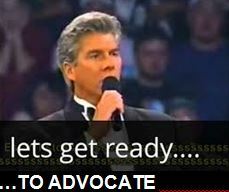 The more often we – HLAA advocates – do this, the higher the compliance rates will be as no cable company or TV station enjoys having to fill out FCC response forms. On January 5, 2017 Senators Dean Heller (R-NV) and Amy Klobuchar (D-MN) introduced hearing aid tax credit legislation (S. 48), which would provide for a $500 tax credit toward the purchase of a hearing aid. Medicare excludes coverage of hearing aids, resulting in a high cost obstacle for many people who choose not to treat their hearing loss. If implemented, the tax credit would apply to all. Senators Heller and Klobuchar both serve on the Senate Finance Committee, which plays a large role in shaping tax reform legislation. Please contact (link below) Senators Nelson and Rubio and request they co-sponsor this Bill. The legislation is identical to S. 315, which was introduced in January 2015. HLAA National has spent a decade advocating for movie captions. They report that on December 6 a Final Rule was issued by the Department of Justice. “On June 10, 2010 the U.S. Department of Justice (DOJ) published an Advance Notice of Proposed Rulemaking (ANPRM), “Nondiscrimination on the Basis of Disability by Public Accommodations – Movie Theaters; Movie Captioning and Audio Description.” Six-and-a-half-years later, the DOJ has issued a Final Rule on the ANPRM. • Provide notice to the public about the availability of these features, including on communications and advertisements at the box office, and other ticketing locations, on websites, mobile apps newspapers and via telephone. Third party websites are not required to provide that information. • Ensure that theater staff is available to assist patrons with the equipment before, during, and after the showing of a movie with these features. We are thrilled to see movie captions recognized and required as an accommodation under the Americans with Disabilities Act (ADA). However, we must make sure these new rules work. Don’t be afraid to complain if you don’t get the accommodations you need. And don’t forget to compliment the theater on a job well-done. The Bipartisan Over-The-Counter Hearing Aid Act of 2016, sponsored by Senators Elizabeth Warren (D-Mass.) and Chuck Grassley (R-Iowa), will be introduced during the 2016 “Lame Duck” session of Congress. It would allow certain hearing aids to be sold over the counter and would eliminate the “burdensome requirement” that consumers get a medical evaluation or sign a medical waiver before purchasing OTC hearing aids. The Act would also require the FDA to issue regulations containing safety and labeling requirements for OTC hearing aids and to update its draft guidance on Personal Sound Amplification Products (PSAPs). HLAA participated in the President’s Council of Advisors on Science and Technology (PCAST) that presented this recommendation last October. The finding was that direct to consumer sale of hearing aids would make hearing aids more affordable and transparent by unbundling the existing sales model. Chapter members are among the 30% of 48 million Americans who are addressing their hearing loss. Some of the other 70 percent do not. The passage of this legislation would economically open the door to assistance to many. On other hand, without the assistance of a licensed hearing aid dispenser or audiologist, the result may not be successful. 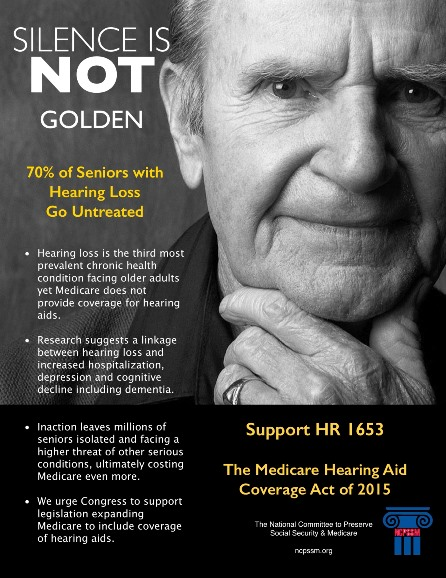 The ideal solution would be for this Bill to be also introduced in the House and combined with the HEAR Act (HR 1653) to lift the Medicare bar on coverage for hearing aids. 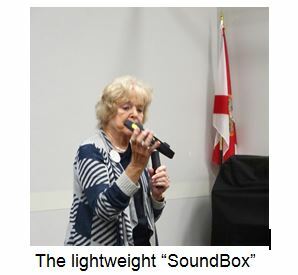 At the November chapter meeting, Flo Innes demonstrated the “TV Soundbox”. This device is for the hard of hearing and hearing as well. The transmitter plugs into the audio port of any TV or other device. Placing it near you avoids the strain to hear the TV. The lightweight “box” can be carried up to 100 feet from the TV and the TV sound can be off so as not to disturb others. No headset is required. The device has a handle for easy transport and an optional headset so the TV sound can be off. The Soundbox can be ordered from Harris Communications at www.harriscomm.com for $149.95 and for HLAA members, a 15% discount is offered. An ad for the TV Soundbox is on page 25 of the current Hearing Loss Magazine. On Dec. 2, 2014, the Federal Communications Commission announced the establishment of a new federal advisory committee, the Disability Advisory Committee (DAC). The DAC will streamline the bureaucratic process to make improvements that help all of us with hearing loss. This year, a hearing assistive device is featured at each Chapter meeting. At the October meeting, tech guru, Flo Innis, demonstrated the ‘Williams Sound Pocketalker 2.0”. This device is a vast improvement over the original Pocketalker. 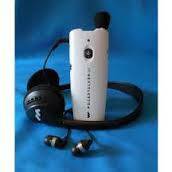 It features a more comfortable design, extended battery life, and superior sound quality. It works with your t-coil and its purpose is to help you hear better in small group settings. It can be hand held or attached to clothing. HLAA members can order the Pocketalker from Williams Sound for $189 at https://www.williamssound.com/. Flo advised she has several older models that have been donated and you are welcome to try them out. Just contact the Chapter at info@hlas.org. The time has come for Medicare to cover the cost of expensive hearing aids. On June 9, 2015, HLAA penned a letter of support for the Help Extend Auditory Relief (HEAR) Act, H.R 2748. On June 12, 2015, U.S. Representative Matt Cartwright announced the reintroduction of the HEAR Act, H.R 2748 with the support of 10 members of Congress. Cartwright first introduced the HEAR Act in 2013. The HEAR Act would provide Medicare coverage for hearing rehabilitation services, including a comprehensive audiology assessment to determine if a hearing aid is appropriate. The Bill would also extend Medicare coverage to hearing aids. He postulated that a growing body of medical evidence impairs quality of life and socioeconomic status. He remarked about the disparity of zero for hearing aids and $24,000 for cochlear implants. He discussed the history of Medicare coverage criteria for a “health benefit” and summarized that “Apparently, the CMS has determined that the published evidence on the health benefits of hearing aids is inadequate, and that, accordingly, hearing aids do not merit any coverage”. He points out that cochlear implants are regarded as Class III devices and hearing aids as Class 1 devices and are exempt from FDA approval. He stated that Medicare coverage “will depend on the willingness and ability of hearing aid manufacturers to quantify the health benefits of hearing aids, which would be directly compared to other covered medical devices “. He intimated that physicians on CMS advisory panels perhaps have a bias to surgical procedures rather than devices sold by hearing aid dispensers may add to the disparate treatment. The HLAA National office recently filed comments with the FAA for airport accommodations. The formal response was to the Federal Aviation Administration (FAA) in response to their draft Advisory Circular (AC), Access to Airports by Individuals with Disabilities. 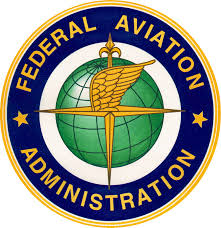 The FAA offered the AC for public review and comments in June 2016. The AC provides guidance and recommendations for operators of airports to ensure access to airports by individuals with disabilities. The National Association of the Deaf (NAD) and Telecommunications for the Deaf and Hard of Hearing (TDI) both signed on to the HLAA comments. FREE Real-time Captioning App for smartphone! InnoCaption is revolutionizing how those with hearing loss communicate by making it possible to use the smartphone (Android & iPhone) as it was intended – accessible, convenient, and mobile. Through the use of patented technology in conjunction with live stenographers, they provide the fastest, easiest, and most accurate captioning for those who may need assistance hearing the other party. InnoCaption App has created a streamlined process that users are directly connected to communication assistants with no need to login. It allows users to make and receive any mobile call the same (functionally equivalent) as any hearing person. And, you never have to miss a phone call again with InnoCaption’s Voicemail with captioned messages! Also, the App provides a lot convenient features, such as Caller ID, contact list synced with existing contact list, Speed dial, Favorite contact, Alternative voice line selection, and supports interactive voice response systems as well as 911 calls with caption. InnoCaption is a free mobile caption service for those with hearing loss within the United States. Paid for pursuant to a program through the Interstate Telecommunications Relay Services (TRS) Fund. The good news is that although the Draft Advisory was addressing all disabilities, well over half of the concern expressed dealt with hearing loss. A few voices can make a difference. Please add your comment! “Kudos to the FAA for its careful analysis of airport accessibility. For the 48 million Americans with the great invisible disability–hearing loss–it has been wonderful to see “hearing loops” introduced at several airports, including both concourses and all individual gate areas of the Grand Rapids Airport, and now several gate areas (A40 and A73 to A78) at Detroit Airport, as well as at several smaller regional airports. As explained at www.hearingloop.org, this hearing assistance system broadcasts sound directly via most hearing aids and all cochlear implants. It requires no more than the push of a button to activate the magnetic telecoil sensor that comes with more and more of today’s hearing aids (7 in 10 models at last count)–thus transforming hearing aid into a customized, in-the-ear speaker that delivers deliciously clear sound. Visually presented information is also helpful to people with hearing loss. But all the better when we can *hear* explanations of flight delays, boarding order, gate changes, etc.–which provides more information than visually available. In 2015, a committee of the U.S. Access Board recommended that such hearing assistance–which can communicate directly to hearing instruments–also be installed in future subway and rail cars, assuming it is technically feasible. If you or a loved one experiences hearing loss, there could be financial assistance available. Children and adults who are deaf can potentially receive disability benefits. Individuals of any age who experience severe hearing loss may also qualify for benefits through the Social Security Administration’s (SSA’s) disability programs. Benefits can help pay for speech therapy and other special services as well as everyday living expenses, medical bills, and even food and housing costs. Social Security Disability Insurances (SSDI) is the benefit program with which most people are familiar. This program provides benefits to qualified, disabled workers and requires you paid Social Security taxes over the course of your employment history. Benefits however may also be available through Supplemental Security Income (SSI). This program is need-based and offers monthly cash benefits to disabled adults and children who meet medical and financial eligibility rules. Whether you’re applying for benefits for yourself or on behalf of a child, you should understand that the SSA only considers hearing loss a severe disability under certain circumstances. • Which show hearing loss or deafness meets a particular threshold. For adults, the threshold is higher than it is for children. This is because children with hearing difficulties often require additional support during the years in which they attain language skills and other developmental milestones. Simply speaking, if your hearing loss keeps you or your child from understanding phonetically balanced words or hearing reasonable sound even with the use of hearing aids, you could qualify for benefits. Children and adults that undergo cochlear implant surgery can also qualify for SSD benefits. In fact, surgery automatically qualifies an applicant medically to receive disability for a minimum of one year after the surgery takes place, though children can continue to get benefits up to the age of 5 years. • For children – the SSA requires a HINT or HINT-C, word recognition score of 60 percent or lower. • For adults – the SSA requires a word recognition score of 60 percent or lower, documented through a HINT evaluation. • You can apply for SSDI online, with the SSA’s website, or at the local SSA office. Call 1-800-325-0778, if you’re hearing impaired, or for hearing applicants, the number is 1-800-772-1213. The SSA can help you schedule an appointment or locate the branch office nearest you. You can also visit the SSA’s website to start your online SSDI application at any time. The New York Times recently reviewed the state of the Medicare gap for hearing aid coverage. The Council suggested, for example, that the FDA permit a “basic” hearing aid, for mild to moderate age related hearing loss to be sold over the counter — something every state prohibits. The NYT story went on to state, “After an audiologist or physician provides an audiogram assessing your hearing, Dr. Christine Cassel, co-chair of the Council’s hearing technologies working group, said, you should be able ‘to take it with you and shop around for the best prices’ on devices. In June, the Institute of Medicine will issue a report on hearing health that tackles key questions like federal regulation, insurance and price. A number of major players — among them the CDC and National Institute on Aging and the Pentagon — have sponsored the yearlong effort. Studies show a relationship between hearing loss — mild, moderate or severe — and accelerated rates of cognitive decline. Older people with hearing loss also are more likely than those with normal hearing to develop dementia. How can aging ears affect so many other aspects of our health? Dr. Frank Lin, an otolaryngologist and epidemiologist at Johns Hopkins University who has led many of these research efforts, points to several possible causes. With diminished hearing, ‘your brain is constantly having to work harder to process garbled sounds’ — a concept called cognitive load — and may have less capacity for other mental tasks. Alternatively, hearing loss may lead to changes in brain structure. In one of Dr. Lin’s studies, MRI tests showed greater brain atrophy among those with poor hearing. ‘In every other aspect of our lives, advances in electronic technology have made things cost much, much less,” Dr. Cassel said. “That hasn’t happened with hearing aids.”’ Almost annually, she added, “some congressperson gets energized about this and tries to pass legislation” to remove Medicare’s hearing aid restriction. Last year, it was Representative Debbie Dingell, Democrat of Michigan, with six Democratic co-sponsors. The bill stalled in committee, but “we are not giving up the fight,” Ms. Dingell said in an email. ‘If it’s $200 instead of $2,000, more people could pay out of pocket,” Dr. Cassel said. “And that also means Medicare might cover it’ — unlikely at current prices. It’s clearly possible to provide good devices for far less than we now pay. The Department of Veteran Affairs, which negotiates with manufacturers for lower prices, provided comprehensive hearing care to more than 900,000 veterans in 2014 and dispensed almost 800,000 hearing aids without co pays. The average cost per device: $400. The 2010 21st Century Communication Video Accessibility Act (CVAA) set a calendar of deadlines by law and by delegation, FCC rules for media producers and distributers to follow for captioning and some requirements became effective January 1, 2016. The 2016 requirement requires that all video clips must be captioned when broadcast. • Accuracy: Captions must reflect the dialogue, sound effects, and music in the audio track to the greatest extent possible based on the type of the programming and must include speaker identification. • Synchronicity: Captions must coincide with their corresponding dialogue, sound effects, and lyrics to the greatest extent possible based on the type of the programming, as well as appearing at a speed that is readable by viewers. • Program Completeness: Captions must run from the beginning to the end of the program, to the greatest extent possible, based on the type of the programming. • Placement: Captions may not cover up other important on-screen information, such as featured text, graphics, or other information critical to the comprehension of the program’s content. For consumers who wish to contact their video programming distributor (VPD) directly regarding a closed captioning problem they are experiencing, the FCC has established a VPD Registry, which contains contact information to reach a VPD about closed captioning. The link to the VPD Registry is http://esupport.fcc.gov/vpd-search/search.action. If a consumer prefers to file a written complaint with the VPD or the Commission you can follow the procedures listed below. For captioning problems during non-emergency programming, you may file a written complaint with either the FCC or your video programming distributor (i.e., your cable or satellite TV service, or the TV station if you do not pay for cable, satellite, or another subscription video service). If you file your complaint with the FCC, the FCC will forward the complaint to your video programming distributor. • a detailed description of the captioning problem. • recorded submissions of the lack of closed captioning, in addition to what is listed above, are welcome but are not required. The FCC has proposed new rules that would require Hearing Aid Compatibility (HAC) for all future consumer wireless devices, including next-generation technologies like Wi-Fi calling and Voice over LTE (long term evolution—3G/4G). The landmark consensus plan would, for the first time, establish a “path to ensure that all wireless handsets are accessible to and usable by people who use hearing aid devices and cochlear implants”. That is good BUT what is not good is that Apple proposes to do away with telecoils! Apple wants to be able to call their iPhones “HAC” (Hearing Aid Compatible) even though their phones are only compatible with a select few hearing aids that are directly compatible with iPhones (Starkey and ReSound). This would mean that the Apple phones will not have a telecoil built in that would make them compatible with all other hearing aids on the market. “A proprietary system that excludes telecoils is accessible and usable only if the consumer uses that one brand of phone that they are locked into. Consumers are literally left out of the loop if they wish to change to a different phone or hearing aid or if the proprietary phone/hearing aid system is broken, lost, or unavailable and they must resort to connecting via someone else’s phone”. feedback about a controversial proposal from Apple (see READ MORE). Having a universal standard allows consumers to more freely choose a hearing aid device. Until a new digital wireless standard is universally adopted by all cell phone and hearing aid manufacturers, the FCC should continue to require support for the current universal technology – the telecoil – in HAC phones. .Let the FCC know that you agree by signing a petition objecting to this change proposed by Apple! 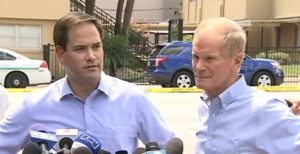 Florida’s primary elections will be held March 15. This means we will be besieged by political ads for the next few weeks. Regardless or party or candidate preference, the Chapter members can create an awareness for captioning with the candidates and their ad agencies. Advertisers have an exemption from the television broadcast captioning requirements of the FCC and some will not spend the comparatively minute’ percentage of the cost of an ad to save a few dollars—apparently unaware that 3,000,000 Floridians are hard of hearing and 145,000 of us in the two county area have difficulty hearing television sound. If an ad is not captioned—by any candidate—fire off an email to the “contact us” section of the candidate’s website. They may ignore one or two but when they see a trend of complaints, they will get the message—especially if you say “I cannot vote for you because of your insensitivity to the hard of hearing, 3,000,000 of us in Florida” (even if you would never vote for that candidate anyway). Below, please find the website of each of the debate qualified candidates. 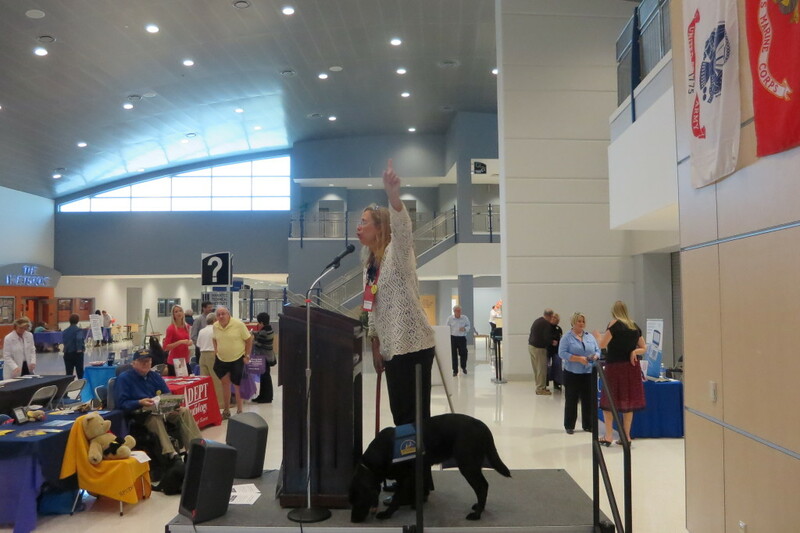 Members of the Chapter who attend the HLAA Convention are very familiar with “hearing” service dogs. We have a service animal or two that attend Chapter meetings from time to time. Abuse of the service dog exception in places of public accommodation was addressed this past session of the Florida Legislature. The law amended Section 413.08, F.S. which requires a place of public accommodation to permit the use of a service animal by an individual with a disability under certain circumstances. The amendment provided for a penalty for knowing and willful misrepresentation with respect to use or training of a service animal. In short, many persons were claiming they needed their dog for emotional support and other reasons. The law more specifically defined what a service animal is and is not. Persons with trained “hearing” service dogs have no problem meeting this test. There are state criminal code and ADA penalties for denying a person and their service animal entry into a place of public accommodation. On the other hand, a person misrepresenting a service dog to gain entry into a place of public accommodation is subject to a second degree misdemeanor and mandatory community service. “HLAA has worked with industry and the Federal Communications Commission (FCC) on the issue of Hearing Aid Compatible (HAC) phones. When mobile technology moved from analog to digital in the 1990s, it created a huge barrier for people with hearing loss in that suddenly people with hearing loss who could use wireless handsets were faced with interference when they held the phone to their ear. It wasn’t until 2003 that the FCC determined that the complete exemption from HAC for wireless handsets would have an adverse effect on individuals with hearing loss and that limiting the exemption was technologically feasible and in the public interest. For all that time, people with hearing loss waited for access to hearing aid compatible phones. Over time, consumer groups such as HLAA and the wireless industry have worked together on HAC issues. We have all been part of working groups under the auspices of ATIS, we have held ad hoc meetings, and we have met with the FCC; and progress has been made. HLAA is happy to know that at least 82 percent of mobile phones on the market have an M3 or M4 rating and 66 percent of wireless handsets are rated T3 or T4. HLAA recently filed comments with the FCC regarding HAC wireless phones. We were joined in this filing by the Telecommunications for the Deaf and Hard of Hearing (TDI) and the National Association of the Deaf (NAD). Together we make it clear that our goal has remained unchanged: we want to see 100 percent of wireless handsets built to be hearing aid compatible. We also want this accomplished while still being committed to working with the wireless industry to ensure the path forward works for both consumers with hearing loss and the industry. On November 19, 2015, during their Open Meeting, the FCC will consider rules that would strengthen accessibility by Americans with hearing loss to emerging and future technologies and services by expanding the scope of our hearing aid compatibility requirements to all forms of voice communication. If adopted, this action would cover emerging technologies such as Wi-Fi calling and VoLTE (Voice overLong-Term Evolution) as well as those that might develop in the future. In addition to these rules, the FCC will lay the groundwork for future improvements by calling on stakeholders to work collaboratively to develop a consensus plan for dramatically expanding the kinds of devices that Americans with hearing loss can use. If there is a better way to consider and implement accessibility at the front end of the handset-design process, millions of Americans with hearing loss will benefit. The draft item makes clear that a consensus solution is the preferred path forward, but the FCC will also seek comments on whether there are other steps it might take to ensure 100 percent of handsets are hearing aid compatible at the same time as promoting innovation and investment”. One year ago, HLAA along with the National Association of the Deaf (NAD), the Association of Late Deafened Adults (ALDA), the Alexander Graham Bell Association for the Deaf and Hard of Hearing (AG Bell) sat down with representatives from the National Association of Theater Owners (NATO) to hammer out an agreement on movie captioning that provide for captioning in movie theaters. Now, the NAD, which was supported by HLAA and other advocacy organizations, has announced another captioning agreement with online movie provider, Amazon. On October 15, Amazon agreed to provide captioning on nearly all of its videos for rent or sale by 2016 as part of an agreement with NAD. Amazon will caption 100 percent of movies and television shows that have been watched at least 10 times in a three-month period. Amazon has provided subtitles on all shows and movies through its streaming arm, Amazon Prime, since the beginning of 2015 but only about 85 percent of its cache of videos for rent and sale outside of Prime have captions. “We are happy to partner with NAD to extend captions even deeper into our back catalog of titles,” said Jim Freeman, vice president of Amazon Video. The advocacy group has made a point in recent years of pressuring online video companies to provide subtitles for deaf people. In 2012, it came to a settlement with Netflix to caption all of its video after taking the tech giant to court. New Survey of User Needs (SUN) for Wireless Technology Launched — Please Participate! HLAA has been working with the wireless phone associations. In September, the Wireless RERC’s research team announced the launch of the 2015 Survey of User Needs (SUN) for Wireless Technologies. The SUN is their cornerstone survey of wireless technology use and usability by people with all types of disabilities. The survey mainly focuses on cell phones, but also includes questions about other types of devices like tablet computers such as an Apple iPad, Amazon Kindle Fire, Microsoft Surface, Samsung Galaxy Tab and other similar devices. More than 6,000 people with disabilities have completed the SUN (survey), and more than half have joined their national Consumer Advisory Network (CAN). Please consider participating in the Survey of User Needs. The results may assist in identifying ADA accommodations needed for the hard of hearing. “The ACA, unlike Medicare does not specifically exclude coverage for hearing aids. In fact, the ACA does not specifically exclude any coverage: It was written in a positive way, delineating several categories of benefits that must be included in insurance policies sold on the exchanges. The Department of Health and Human Services referred to these as benchmarks for essential health benefits. But the territory is murky. As the HLAA has noted, coverage for hearing aids, hearing-aid accessories and hearing tests is a gray area”. Her article pointed out that states differ in their coverage of hearing aids. The majority of states, Florida included, prohibit coverage for hearing aids for people of any age, including children. This week, HLAA’s attorney, David Gayle, responded to an email about this HHS provision. That passage, he said, was ‘perhaps more optimistic than it should have been.’ HHS itself was optimistic in its expectation that many states would be including hearing aids under the benchmark minimum coverage. Since hearing aids and associated costs are not specified in the statute, HHS has no regulatory power over what the states provide in terms of hearing-health care and hearing aids. Meanwhile, AARP offers some helpful suggestions for paying for your hearing aids when the ACA, Medicare or other insurance won’t. In addition, some states include hearing aids in Medicaid benefits. Veterans and federal employees are usually entitled to hearing aid coverage. Some Medicare advantage plans include hearing aids. As the AARP article states, you may also be able to bargain down the price”. The Hearing Loss Association of America, the organization that all Chapter members belong to and contribute to is active before many agencies in Washington as well as Congress. HLAA filed comments last month in the “Access Board’s Notice of Proposed Rulemaking” (NPRM) on information technology (IT) under Section 255 of the Communications Act of 1934 and Section 508 of the Rehabilitation Act of 1973. The comments were filed with Telecommunications for the Deaf and Hard of Hearing (TDI), National Association of the Deaf (NAD), UITA-RERC AND RERC-TA at Trace R&D Center, and RERC-TA at Gallaudet University. The HLAA comments covered IT as it impacts people with hearing loss, including Real-Time Text display, magnetic coupling, minimizing interference between hearing devices and other technologies, user controls for captions, and other related issues.